62-year-old Ok Jin Jun has filed a lawsuit against the LAPD, the city of Los Angeles and two police officers. In Los Angeles, a 62-year-old woman has filed a lawsuit against police officers who she says roughed her up during an early morning encounter last month in a Koreatown church parking lot. Ok Jin Jun is suing the Los Angeles Police Department, the city of Los Angeles and two police officers. The altercation was captured on surveillance video. Footage shows an LAPD SUV following Mrs. Jun's car as she pulled into her church's parking lot for early morning prayer service on April 14. Mrs. Jun says the officers followed her after she honked her horn at them because they were blocking the church driveway. But this was not a traffic stop, and Mrs. Jun was not being pulled over. 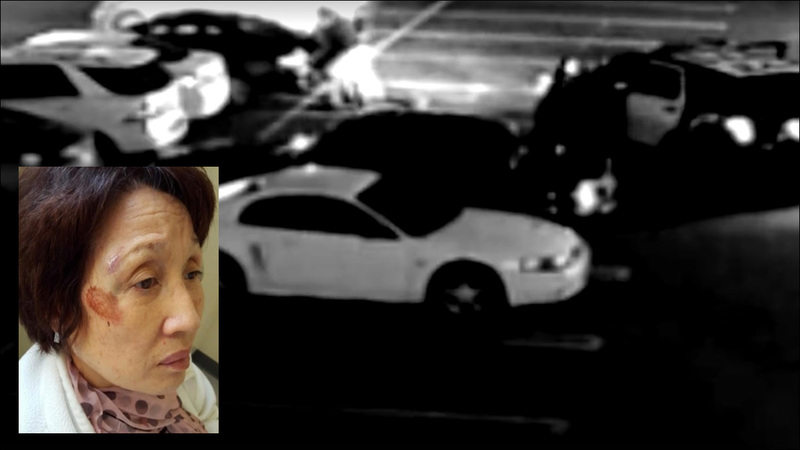 When Mrs. Jun stepped out of her car, the officers confronted her, demanding to see her registration. Mrs. Jun, who does not speak much English, tried to call 911 for an interpreter, and also tried to call her husband. That's when things escalated with the officers, and a physical struggle ensued. "Without citing her for any traffic law violations, they immediately grabbed her by the wrists and twisted her aggressively down to the floor," David Yun, Mrs. Jun's son, detailed in a Facebook post. "When she fell onto the ground (as you can see from the video footage), they handcuffed her and while in full submission, they forcefully rammed the side of her face onto the floor." It's difficult to see what's happening in the video, but before it was all over, four more LAPD cruisers had arrived on the scene, and Mrs. Jun was bleeding from severe facial wounds that required medical attention. Paramedics took her to a local hospital, where she was treated for her injuries. It doesn't appear as though Mrs. Jun was charged with anything. A police source allegedly told CBS2 that the officers in question are "being reviewed for a routine use-of-force report," and also that "mental health" may have played a factor in the incident. What does that mean? And are we really calling early morning bloody altercations with church-going ahjumas a "routine use-of-force"? Meanwhile, Mrs. Jun tells CBS2 that she remains deeply traumatized by the incident. "I'm even fearful of people because police officers are the ones I'm supposed to be able to trust."